I’ll have some judgement with that sandwich, please. 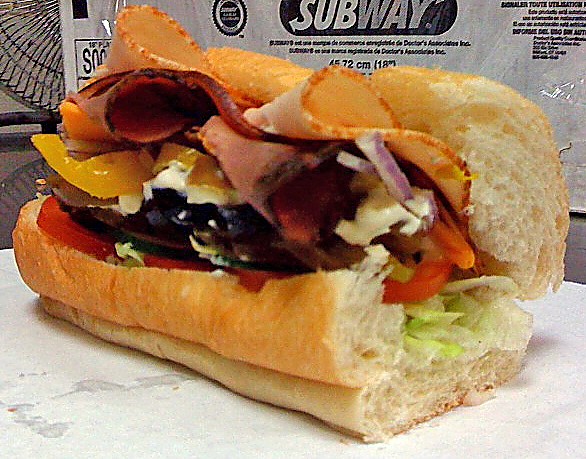 The hubster and I stopped off at Subway on the way home from our Weight Watcher’s meeting last night and, as usual, we ordered our six inch, whole wheat, chicken/turkey breast sandwiches…without the cheese. “No cheese!” we answered in chorus. She stared at us for a moment, the answer still failing to register. “You don’t want any cheese?” Her tone was dubious, as if she hadn’t heard us correctly. “No. No cheese,” we reassured her, smiling. She just stood there staring for another second as the full weight of realization pierced some thick, cheese-adoring cloud in her mind and then, before our wondering eyes, she took a deep breath…eyes widening and rolling back, lips curling a little in contempt…before finally shrugging off the utter stupidity of such a request. She slid our sandwiches past the cheese tubs in disgust, leaving them to wait their turn in the vegetable queue, then turned to wait on the people behind us without another word. Ah…the power of cheese. I’m pretty sure this woman loves it. A lot. I’m equally sure that she had no idea what her body language was saying. Frankly, it was like watching a small child who hasn’t yet learned the intricacies of polite diplomacy; her response was spontaneous, unconscious, full bodied, and 100% honest. My apologies, ma’am. Truly, we meant no offense. We really love cheese, too, it’s just that we’re tired of being fat. (my list of points is on the fridge as we speak)having said this my carb fest yesterday ( dueto some bad news) has just kicked my points INTO SODDIN SPACE! Ah yes…it’s amazing the amount of point-carnage available in one brief binge, no? I myself plateaued for roughly four or five months but have recently started creeping up again. I must, really MUST, regain some discipline. I hope your bad news wasn’t too bad!